The Intermediate Unit 1 Educational Campus at Colonial School serves 25 schools in the counties south of Pittsburgh. Funded by Chevron at both the corporate and local level by a grant to the Fab Foundation and implemented by TIES, the stationary Fab Lab at the Colonial School includes a suite of digital fabrication equipment and an electronics lab. 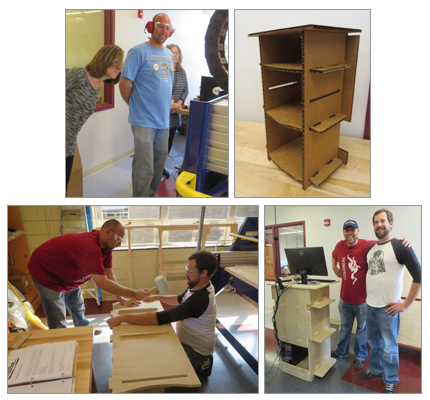 One of the important parts of the installation effort of a Fab Lab is training and education. So before the installation team left, teachers and administrators were trained on the basics of each machine, and created a project to show how the various design software can be used cross-platform. For example, parts created in VCarve Pro CAD (computer aided design) software for full-size production in wood on the ShopBot were scaled smaller and cut out of cardboard on the laser cutter to test the concept and design. Likewise, files originally designed for printing on a 3D printer (additive technology, building up layers of material to create something from nothing) can be reformatted to machine out of a block of material with a ShopBot CNC (subtractive technology). After the educators have had a chance to experiment with the digital technology and electronics lab, TIES will return for additional professional development on how the Fab Lab can be used to augment the educational goals of the school system and engage the students and teachers. Hathaway Brown is Ohio’s oldest continuously operating college preparatory school for girls. Walking the halls, one can see certificates of patents held by some of its students, art projects, and theatre or music production posters. 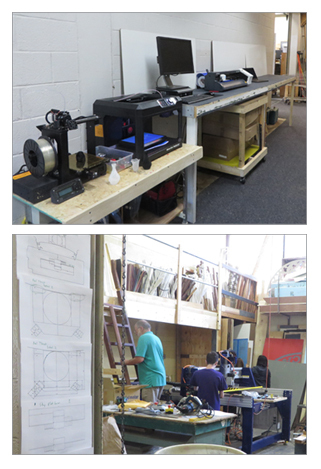 Their former woodworking shop has been reformatted as a Fab Lab for the middle school age girls. Who will use the lab? A faculty member from the theatre department participated in the trainings and brought files for a set for the spring production of… I was sworn to secrecy, sorry! The robotics program for the upper school girls will share the space and they are mentored by volunteers from think[box] at Case School of Engineering. Fab Lab Manager, Leah Jackson, is a graduate of Hathaway Brown, and is thrilled to be back at the school. Hawken School is creating new specialty spaces to expand programs in entrepreneurship and media studies: The Miller Fabrication Lab, Media Lab, Media Production Studio, and Screening Room. Nick DiGiorgio, formerly with the Cleveland School District in STEM education, is now the Digital Lab Manager at Hawken. 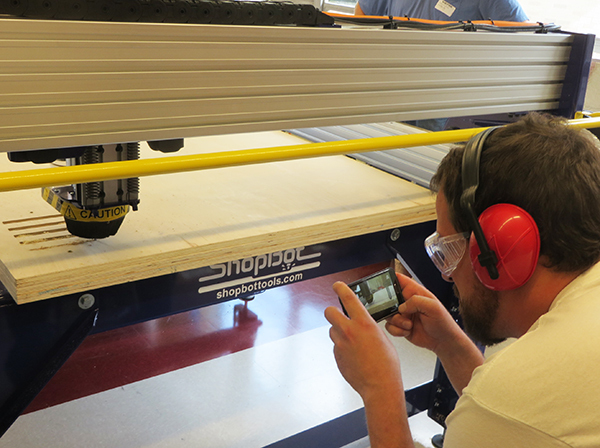 Until the new spaces are complete, Nick is fitting the digital fabrication equipment into the space available – Hawken’s ShopBot is housed in the set production room of the theatre department, and the laser and 3D printers line the hall. Nick’s long time collaboration with the Fab Lab/makerspace community can be seen in examples of the carts that he designed for three of the mobile Fab Labs associated with the Chevron Labs. While the mobile Fab Labs are a topic for another blog, this is a good point to talk about the community that arises around the Fab Lab/makerspace movement. Administrations and teachers and parents are talking to each other – the movie mentioned at the end of this post (“Most Likely to Succeed”) was screened at Hawken, and there was a panel of public and private school administrators to discuss the issues raised in the film after the screening. And Fab Labs/makerspaces are collaborating to exchange programming, design, and production services as needed. 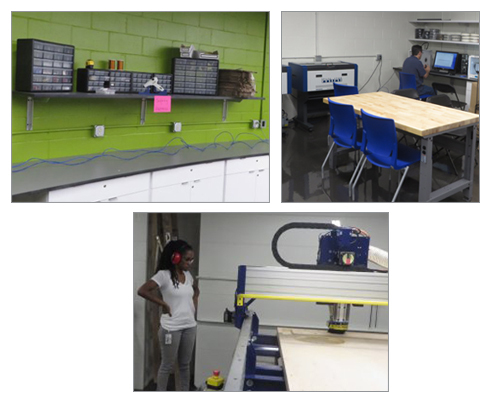 One of the longest running FabLabs can be found at Lorain County Community College in Elyria, Ohio. As a community college, LCCC is charged with a number of tasks, from GED prep to early college; from job (re)training to entrepreneurship; from continuing education and community outreach to 2 year degrees; and partnerships with 4 year institutions. Its Fab Lab does offer production services, as long as the services do not complete with a local business. 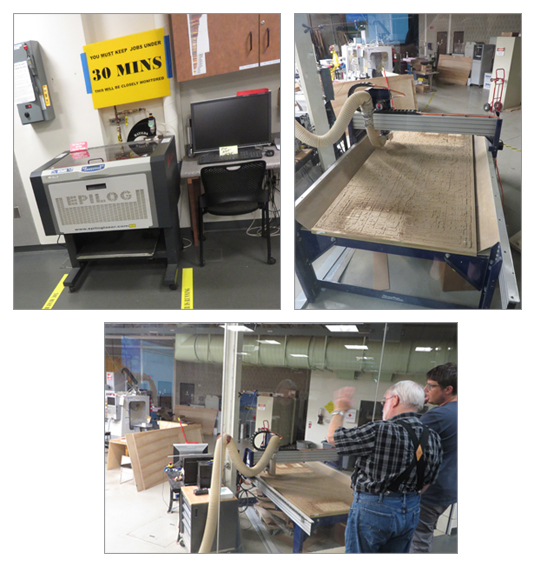 The cabinetry for the three existing Chevron mobile Fab Labs was machined at LCCC, and here is a photo of the ShopBot table to prove it! As part of the US Fab Lab Network, Lorain’s David Richardson worked with the National Association of Community College Entrepreneurs meeting (NACCE) to educate and communicate to the attendees about adding makerspaces to encourage entrepreneurship. To gain more of an understanding of why many schools in the US are interested in putting in makerspaces, digital FabLabs or the like, take a look at the film “Most Likely to Succeed.” It contrasts how students become (dis)engaged with math and problem solving skills when they are taught in a traditional lecture format, compared to a hands-on approach that includes project-based learning, making, and community engagement.